We are working our way through POTTY TRAINING. As I have admitted before, with our last toddler that took 18 months to potty train – I am learning, just like these boys are. With my last toddler, he didn’t have the urge or care to pee in the toilet. Our soon-to-be 3 year old does actually want to use it. It’s just the consistency. 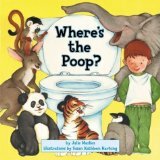 This is by far our favorite potty training book and something I give often at baby showers. There you have it, 10 potty training books for kids to start your potty training adventure! Good luck! If you have a favorite book, make sure to leave it in the comments!